Over this past weekend I had the amazing opportunity to be reminded what the Christmas spirt is all about. Now hopefully everyone who reads this blog will take it from me and not have to experience it the way I had to! Here is my weekend story. Friday at work I could feel myself being a little sluggish and just assumed it was due to only eating a granola bar for the day. So, I grabbed another granola bar and headed off to pick up my kiddos from school. Later that evening I helped my kids with their homework, school projects and took time to read a few chapters of our book together. My sister dropped her twin 5-year old’s off for the night as well. The kids had a great time playing together and running about. When it was finally time for bed, I tucked the 5-small people in and sat on the couch to catch up on some work I had. Well after midnight I crawled into bed feeling very tired. 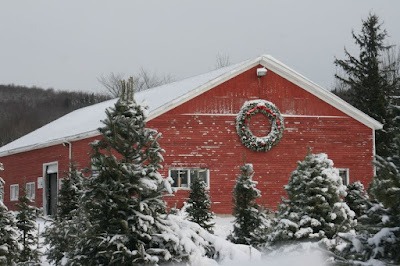 I armed myself with Dayquil, Tylenol and ibuprofen and the 7 of us headed to Piper Mountain Tree Farm in Newburgh, ME. It was a beautiful day out as we drove through the country side. I was determined to have our day be magical no matter how much pain I was in. After all Christmas is all about the children right!? 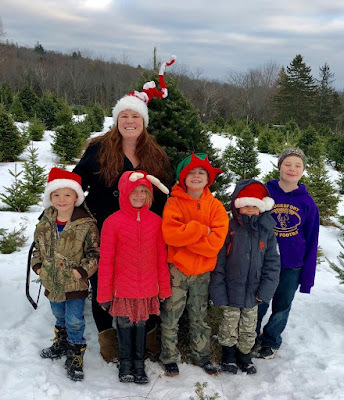 As we made our way to the Christmas tree farm the kids become restless and started to argue amongst them self’s, thankfully we had made it to the tree farm. 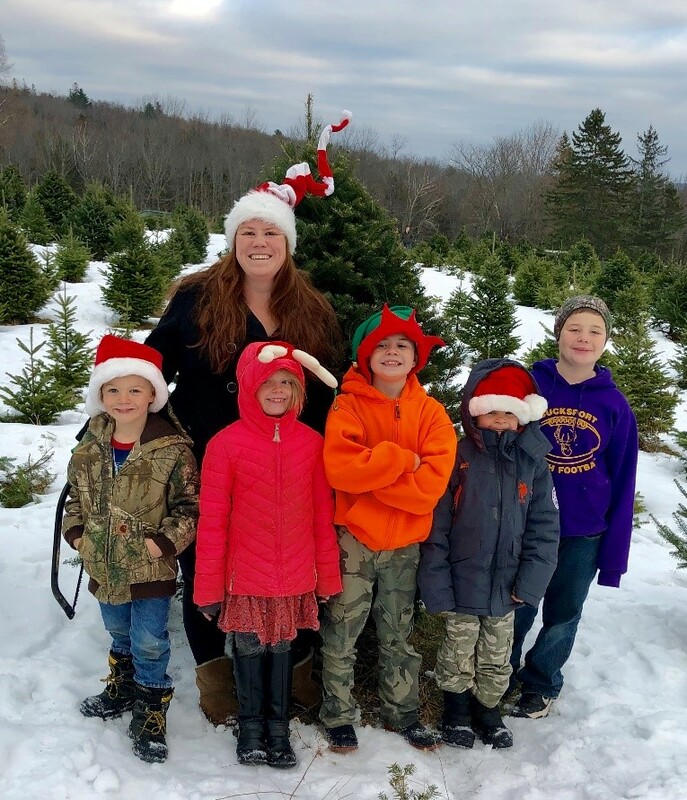 Piper Mountain is an amazing place where my family goes every year to search for the perfect tree. Every year the kids all get a chance to cut part of the tree down and then we all lug it out together! This is a tradition that I have done with my parents. This tradition marks the start of the Christmas season for my family; there was no way I was going to let a headache stop me. 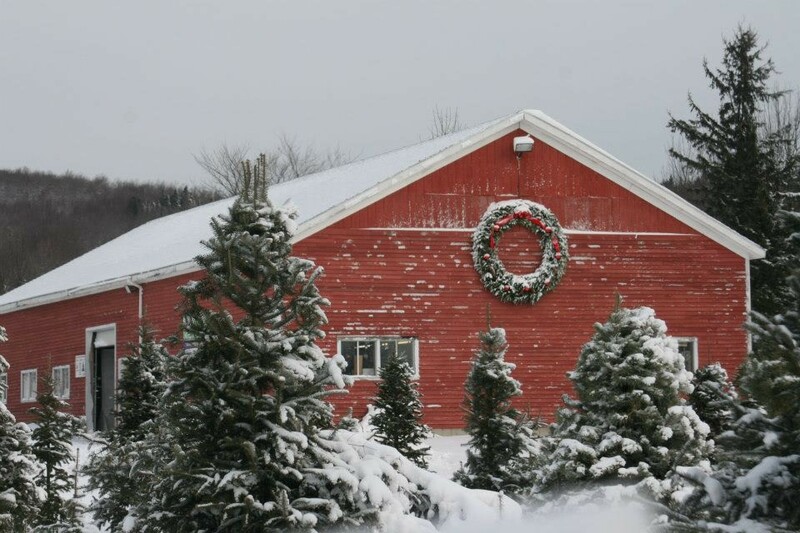 We spent about an hour running through the tree farm looking for the perfect tree. The kids giggled and laughed with delight threw the trees. It was a magical day with the crisp mountain air and people all around us having fun. The Christmas spirit was so strong, yet so was my headache. I ran back to the car and took some more ibuprofen. Fingers crossed it will hold this massive hurricane in my head at bay. The children finally found their perfect tree and started to saw the tree down. This year was especially magical because my little sister’s boys have never been able to come with us before. Their eyes lite up with the idea of using the hand saw to cut down the tree! The kids got the tree cut down and decided they were going to lug it out. They were so proud to lug the tree down to the wrapping station. After the tree was wrapped in twine, we strapped the tree to the car. The kids giggled with delight as they climbed into the car to head home. All 5 kids had huge smiles on their faces. It was a perfect day. The sun started to set as we pulled away from the Christmas tree farm. Today was perfect for my family and the day wasn’t over yet! 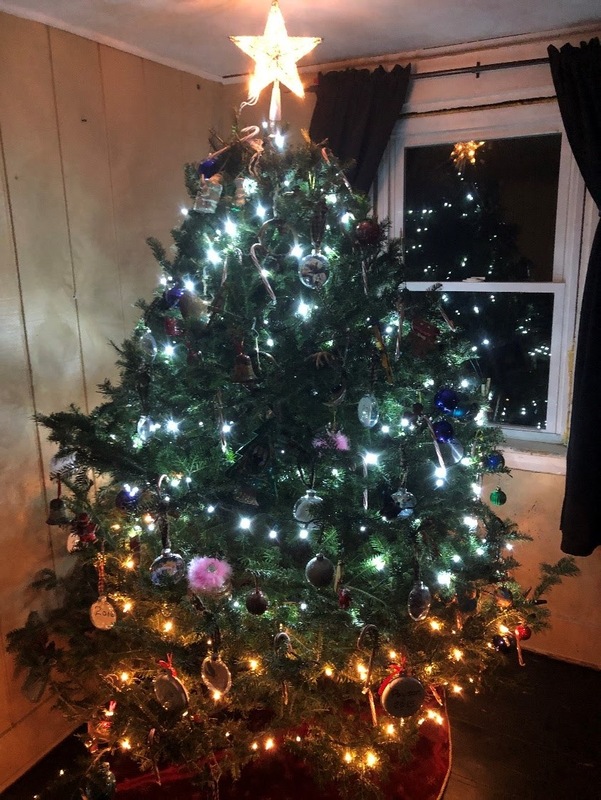 Once home we brought the tree in and set it up. The kids played while we waited for their dad (my ex-husband) to arrive. Every year we decorate the tree as a family, all of us. 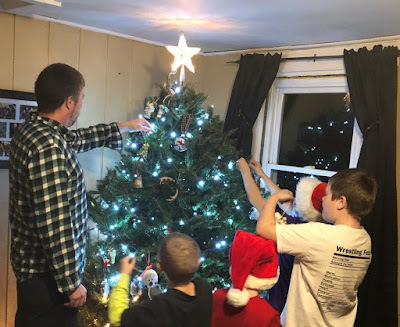 When their dad arrived, we ate dinner and then decorated the tree. The day was winding down to go in the record books as a perfect day for my children and nephews. We played games, had a wonderful meal and made the tree look perfect as a big old happy family. We said goodnight to my sister who was heading home and her boys. Then my ex-husband and I settled our children into bed, with goodnight kisses, hugs and I love you’ s.
I said goodnight to their dad and crawled into be myself. The perfect Christmas Tree day had taken its toll on me; it was time to finally rest. Sunday morning, I awoke with the same headache only worse. I tried medicine to help it get better but there was no relief in sight. Pushing my self yesterday to be super-human had caught up to me now. My amazing children knew I had felt sick yesterday and pushed threw for them, and they saw the pain on my face this morning and insisted I stay in bed today. My oldest son, Joseph brought me some hot cocoa and helped his siblings get breakfast. He also took my temperature and brought me a cool washcloth for my head. Zachary brought me cough drops as my throat was burning with pain now. Payson my daughter came in and read me a story she wrote to help me feel better. Joseph then reminded me that selfcare is just as important as caring for others, sometimes more. My 10-year-old was able to speak as an adult and remind his mother that sometimes you need help and its ok to ask for it. As the day went on my son told me that he and his sibling thought it best to call a family friend to come help cook lunch and dinner, later he admitted he also wanted to play with his friends too. Our neighbor and good family friend came over with his son and daughter. He brought Dayquil and NyQuil and suggested I take the NyQuil and get some sleep. On more than one occasion I have watched his children and he has watched mine, so I did as he suggested and got some sleep. When I awoke it was starting to get dark. The dishes were done, dinner was made, the floors were clean, and the wood box had been filled. My son asked if I was hungry and grabbed me some dinner. I was feeling much better but ate and went back to bed to rest. My kids put themselves to bed and our neighbor let himself out. It was a quiet and amazing weekend. As I laid in bed and recapped about the weekend, I couldn’t help but smile. My little family had an amazing time. Although I shouldn’t have pushed myself and most likely should have rested, I wouldn’t have it any other way. I pulled myself forward to make Saturday great for them and they pulled them self’s together to make Sunday bearable for me. We truly did kick off this weekend with the Christmas Spirit. Faith, family, love, community, these were all themes of my weekend. I truly feel blessed to have a support system of love that I have.